Tonight we’re at Bergfried Alm. Same deal as last night — they’re ready to serve everyone dinner and serve drinks until the last geek falls over. We’ve booked an entire room again. The pub is in the village centre close to the church, opposite the old Tourist Office. For geekskiers: it’s the old Hühnerstall Aprè Ski place (Unterwirt) that has a new name and new owner. We will drink from 7pm onwards. Shirts are available in different sizes, ladies and men shirts. Please do keep in mind that we’re not shipping them. They must be picked up in person at the LBW. If your plans change, please organise to have your order collected, or cancel it using the link above. 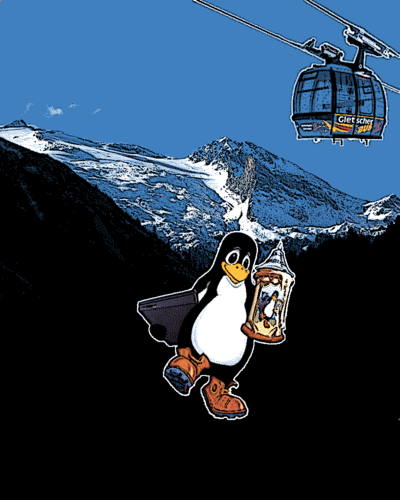 The picture shows the glacier of Hintertux with a Gletscherbus cable car going up; in the front is our logo (the hiking Tux). I’m still negotiating costs, but a shirt is likely to be about 25 Euro. Ordering will start soon via the registration system. During the next few weeks, I’ll start adding events and walks — feel free to do the same and help us to organise a great week in Tux! I’ve spoken to the Tourist Association (Tourismusverband) about dates, so it’s time to vote. 🙂 The following poll shows 4 potential weeks for LBW 2011 in Lanersbach, Tux. Note that all weeks are from Saturday to Saturday. Please choose your favourite week(s) — more than one choice is possible. Voting starts now and stops on Friday, 26th of November, in the evening. So if you want to vote, I suggest voting before Friday. I’ll book the hall and announce the final dates on Monday, 29th of November.